Palmiero Jewellery Design represents one of the most sought-after firms on the international jewellery panorama. Since 1979, in the laboratory-atelier of Valenza, Carlo Palmiero has conceived his extraordinary creations full of genius and audacity. Limited edition jewels and watches with strong personality, haute couture pieces made of gold and precious stones. Palmiero Jewellery Design displays top quality and creativity, authentically haute de gamme and authentically Made in Italy. Alter Man shows patented technology. Made in Italy equipped with swiss movement. The idea is an exclusive watch for different occasions. 3 turning dials in one watch. 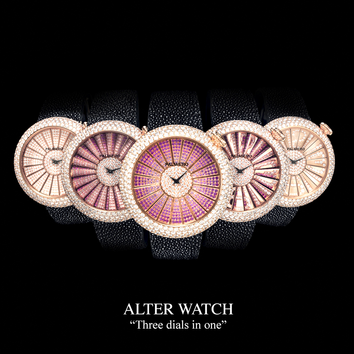 Available in yellow, rose and white gold. Limited edition. Inspiration comes from the playful and sensual ballets like the cancan, and from the dancers’ dresses. The necklace in white diamonds and rubies with patented flexible core embraces the neck, it is easy to wear, in an almost playful way. Another novelty belonging to the Alter Collection, Three Dials in One, is the model having slightly small dimensions, 39 mm dial. Three rotating dials with different colours and designs for smaller wrists. Patented Watch. A white diamond pavé frame surrounds, sustains and beautifies the intense central rubellite. Inspired to the Čajkovskij’s “Swan lake”, Palmiero interprets the character of Odette, the beautiful princess transformed into a swan. A brooch that symbolically expresses the power of love. Entirely made by hands and fully set of diamonds. An embrace to show our esteem. Soft petals ready to welcome and protect any fragility, even that one of the gemstone that has inspi- red the designer: we see mountain lakes and Carribean seas from above, another Carlo Palmiero’s homage to Mother Nature.